Craig Levein’s Edinburgh derby record stands comparable with any, so it was no coincidence he referenced the fixture during his unveiling as Hearts manager this week. Between 2000 and 2004, Levein managed Hearts 14 times against Hibs, winning seven games, drawing five and losing just two. His team scored 25 goals and conceded 15 in those fixtures, and he is fiercely proud of such statistics. The 52-year-old has agreed to return to the dugout from his director of football role at a time when Hearts need a figurehead offering experience and stability. They also need someone who can revive their derby fortunes. 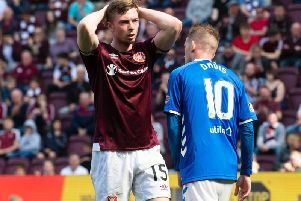 In 18 meetings with their Capital rivals since the 5-1 Scottish Cup final triumph in 2012, Hearts have managed just five wins. The club’s last two head coaches, Robbie Neilson and Ian Cathro, were both chastised by fans for Scottish Cup defeats against the Easter Road side. The fixture means that much. As Levein well knows, a Hearts manager who can’t get the better of Hibs won’t be Hearts manager for long. One of his fondest memories is that comeback from 4-2 down to draw 4-4 with the club’s biggest enemy at Tynecastle in January 2003. It became known as the ‘Graham Weir Derby’ following the striker’s two late goals. Such resilience has been conspicuous by its absence in recent Hearts derby performances. “I didn’t think they looked like a team in the last few derbies, it was kind of like individuals. I think Craig will change that,” said Weir. “He’ll start off at the back. He was a centre-half himself, so he’ll shut up shop and make sure Hearts are defensively tight. Then they’ll open teams up playing as a team. That will be the difference. “It’s definitely a good appointment for Hearts. I know he hasn’t been managing for a few years because he’s been upstairs but you still have those managerial instincts. “He gets the best out of players. He just knows how to get the best out of them. He’s got a stature because he’s a big guy. He’s intimidating but, at the same time, he gets respect from the boys. He didn’t really change much for derbies. I don’t think you need to say that much to players because, if you can’t get up for a derby, you can’t get up for any game. The two Edinburgh teams next meet on October 24 at Easter Road, which gives Levein almost two months to prepare. He won’t be willing to accept any blemish on that derby record. “He definitely will be proud of that and rightly so. Any manager would be proud of his record,” said Weir, who joined junior club Hartill Royal this summer from Linlithgow Rose. “Any derby is big, whether it’s the Old Firm or the Manchester derby, but the Edinburgh derby is massive to Hearts and Hibs fans. Craig will rightly be proud of his record in those games. I really liked playing under him. He’s a right good manager. “He got good results with Hearts, finishing third a couple of times. Rangers and Celtic were strong at that time. I wouldn’t say Rangers were strong any more, although Celtic still are. Craig did really well getting Hearts into Europe twice when he was competing against them. That’s because he had the team playing for him. “He had a good management team round about him, too. There was Peter Houston, John McGlynn and Gary Kirk. Everybody gelled together because they all got on well. “Craig would take you into his office one-to-one and speak to you. If you weren’t playing well, he would have a word with you. If you were playing well, he’d still have a word with you. He didn’t just leave you alone if you were doing well, he’d keep speaking to you. None better than that soggy afternoon in Gorgie on January 2, 2003. Weir’s stoppage-time intervention went down in Edinburgh derby folklore as the comeback to end all comebacks. “It’s a bit embarrassing to say but I do still watch that game from time to time to boost the ego a wee bit,” he laughed. “If you’re having a shocker, it helps. “Then again, sometimes it can bring you down too. You watch it and think: ‘I wish I was back doing that.’ They were right good days. “I don’t stay in Edinburgh so people don’t mention it to me so much now. When I used to work in Edinburgh, boys used to talk to me quite a lot about it. It’s definitely a good memory and something I’ll always remember. “It’s still clear as day, even now. It’s a bit surreal. It’s obviously every boy’s dream to score in a derby, so to score two in the last couple of minutes was unreal.